The Visit is coming to Blu-ray and DVD on January 5th, as well as Digital HD on December 15th, and I have a copy for one of my lucky readers to win! I don't usually watch horror movies, but I saw the film back in September and liked it. A family visit takes a terrifying turn when two siblings learn who Grandma and Grandpa really are in The Visit, a found documentary-style suspense thriller coming to Digital HD on December 15, 2015, and Blu-ray™ and DVD as well as On Demand on January 5, 2016 from Universal Pictures Home Entertainment. 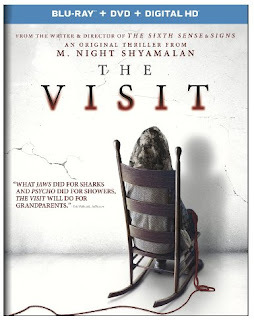 The first collaboration from Academy Award®-nominated writer-director M. Night Shyamalan and Academy Award-nominated producer Jason Blum, The Visit Blu-ray and DVD are packed with exclusive bonus features including deleted scenes, behind-the-scenes featurette, and a suspenseful alternate ending. Enter via the widget below. Giveaway will end on Wednesday, December 16th, at 11:59pm, and winner will be notified the next day via email, and have 24 hours to respond, or an alternate winner will be chosen.